These cauliflower bites consist of battered cauliflower coated in crispy panko and smothered in a sweet and sticky sesame sauce. 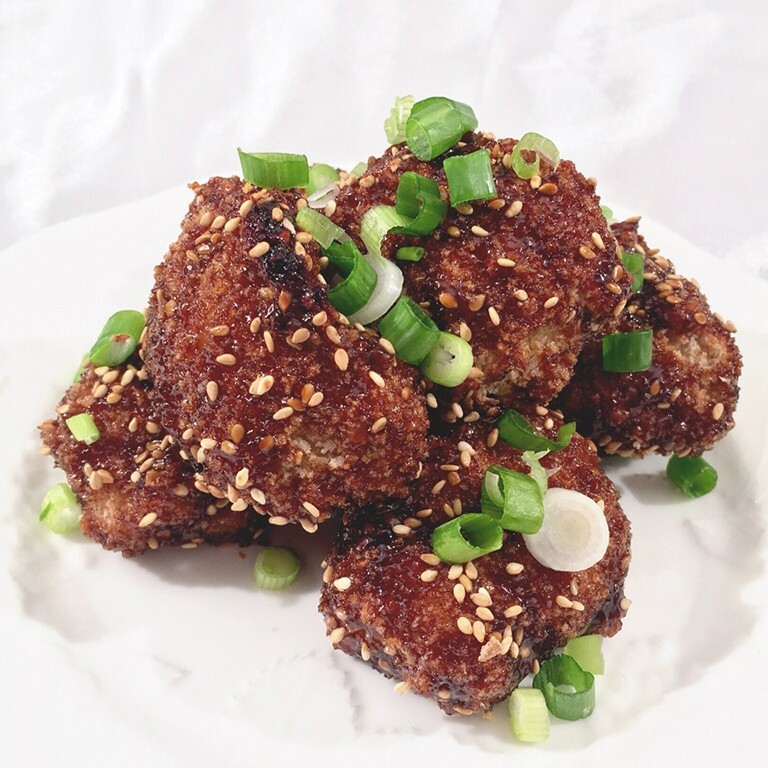 Cauliflower serves as a high fiber, low-calorie alternative to chicken wings, and the panko coating accurately simulates the work of a deep-fryer. Along with providing a nutty flavor to the dish, sesame is a good source of magnesium, a beauty nutrient. Magnesium works together with calcium to keep teeth healthy and strong. This dish is sure to please a crowd! The saltiness and sweetness of the sauce is balanced with the garlic, ginger, and vinegar. Top the cauliflower with scallions for a bit of freshness. Preheat oven to 400 degrees Fahrenheit. Line two baking sheets with parchment paper. In a medium bowl, mix together flour and water until a batter forms. Place panko breadcrumbs in a separate medium bowl. Dip a cauliflower floret in the batter so it is completely covered. Roll the battered cauliflower in the panko breadcrumbs and shake off the excess and place it on one of the lined baking sheets. Repeat for the rest of the cauliflower florets. Bake the cauliflower for 20 minutes. While the cauliflower is baking, add soy sauce, honey, rice vinegar, cornstarch “slurry”, oil, garlic, and ginger in a small pot. Bring to a boil and then reduce heat to medium and cook, stirring occasionally, for 5-7 minutes, until sauce has thickened slightly. Remove from heat and stir in two tablespoons of the sesame seeds. Once cauliflower has finished baking, remove from the oven. Dip each cauliflower piece in the sauce, shaking off the excess, and return to the baking sheet. Sprinkle the remaining tablespoon toasted sesame seeds over the cauliflower. Return cauliflower to the oven and bake for another 10 minutes. To serve, sprinkle cauliflower with sliced scallions.